SolarCity (SCTY) said today that it is receiving $305 million from a private investment firm to help fund its solar projects. NEW YORK (TheStreet) -- Shares of SolarCity (SCTY were higher in pre-market trading on Monday as the San Mateo, CA-based solar energy company said today that it raised $305 million to finance solar projects. The equity investment was provided by a private investment firm affiliated with Quantum Strategic Partners and was advised by Soros Fund Management, SolarCity said in a statement. The transaction also included an 18-year-loan syndicated to five institutional investors. Last month, SolarCity said in an SEC filing that several of its financing commitments had been delayed as a result of its proposed $2.6 billion sale to Elon Musk's electric vehicles manufacturer Tesla (TSLA). 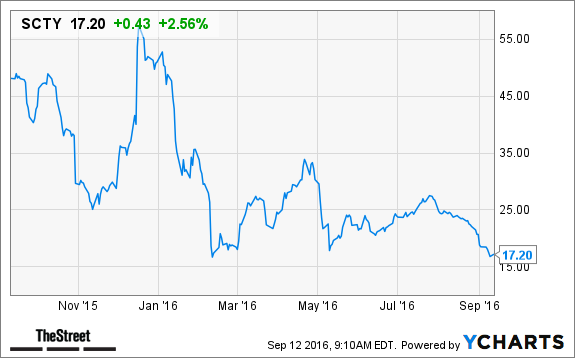 SolarCity's cash had declined to $146 million as of June 30 from $421 million a year earlier. The team rates SolarCity as a Sell with a ratings score of D. This is driven by a few notable weaknesses, which it believes should have a greater impact than any strengths, and could make it more difficult for investors to achieve positive results compared to most of the stocks the team covers. The company's weaknesses can be seen in multiple areas, such as its deteriorating net income, generally high debt management risk, disappointing return on equity, weak operating cash flow and generally disappointing historical performance in the stock itself.